James Proud grew up in a particularly rough part of South London. At age 12, when he started earning spending money by designing websites, his mum thought he had become a drug dealer. By the time he graduated, Proud had figured out that he was more interested in entrepreneurship than furthering his academic career. So, even though he did well enough in school that he had the opportunity to become the first in his family to attend university, Proud decided instead to pursue a career in the technology industry. “My parents went insane,” Proud says. 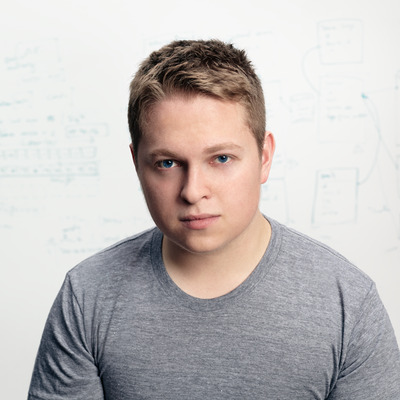 Fast forward to today: Proud, now 24 years old, is the CEO of Hello, which makes Sense — a $129 sleep-tracking device for your bedroom that raised $2.4 million on Kickstarter in 2014. Proud promises it can actually help you sleep better. On Monday, Proud revealed for the first time that Hello raised a $30 million round of funding in late 2015, led by Temasek Holdings, the venture capital arm of the Singapore government, to further develop the Sense device. Overall, including the Kickstarter proceeds, Hello has raised over $40 million. It’s been a long, winding trip for Proud. In 2009, at 18 years old, Proud started GigLocator, a site to track when your favourite bands and artists were playing near you so you could buy tickets. Six months later, that qualified him for entrance to the inaugural Thiel Fellowship, a two-year program where Peter Thiel — the famed, and currently controversial, Silicon Valley venture investor — pays promising young entrepreneurs $100,000 to skip college and pursue their original business ideas. In 2012, Proud sold GigLocator to Peter Shapiro, the owner of New York’s legendary Brooklyn Bowl nightclub and its international franchises. He now says he was never super in love with it as a long-term business strategy anyway. “GigLocator was a side-project that turned into a thing,” he says. The money went into Hello, his new venture, and he started considering what he actually wanted to do. He decided to focus his efforts on solving big problems, and decided to start with the concept of sleep. Everybody does it, but not everybody is good at it, making it a ripe business target. “Our ambitions are bigger than sleep, but there’s so much to do in sleep,” Proud says. When Proud first founded Hello, his team conceived of a wearable, kind of like the Apple Watch or a Fitbit, that you’d wear to bed. To make the dream a reality, Proud got highly-placed tech figures including Facebook Messenger head David Marcus and Xiaomi VP Hugo Barra to invest a little over $10 million. Which was great, except for the part where Proud realised they were on the entirely wrong track. Wearable gadgets are great in theory, Proud says now, but people stop wearing them pretty soon after getting them. And if people aren’t wearing them, they aren’t gathering data, and the whole exercise is rendered pointless. To his point, he says that 15 months after Sense hit the market, 70% of customers are still using theirs every night, while 99% of people ditch their wearables after only a few weeks or months. 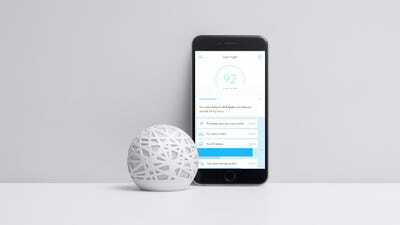 SenseThe Hello Sense device was designed to blend in on nightstands. After what he describes as a difficult, not-so-fun meeting with his investors, Hello decided to start all over with a new design, and a Kickstarter campaign that would raise $2.4 million. The new Sense — the same one that you can currently buy — is a tiny, unobtrusive little gizmo that sits on a nightstand. A little “sleep pill” sensor clips on to your pillow (you can buy two if your partner wants one, too). All you have to do to gather that data is sleep. “You should be able to come home drunk and collapse in bed and it will still collect data,” Proud says. 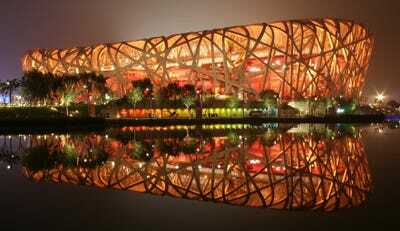 The Sense device itself is inspired by the look of the Beijing National Stadium, where the 2008 Olympics were held. It was designed to look elegant and not at all like your garden-variety black box of a gadget — if it stuck out in any way, people might remove it from their nightstands, and all would be lost. Under the hood, Sense sports a variety of sensors, including those for humidity, noise, light, and air quality. If your room is too bright, too noisy, or too humid for you to get quality sleep, it will glow to let you know. Otherwise, you get the green light go-ahead. Wikimedia CommonsThe Beijing National Stadium, now abandoned, was the visual inspiration for the Sense sleep tracker. The “sleep pill” sensor tracks your head movement on the pillow to analyse your sleep pattern. The Sense has a speaker — at night, it can be used for relaxation-inducing white noise; in the morning, it’s an alarm that goes off when you’re naturally ready to wake up, so you’re ready to take on the day. Every morning, you get a sleep score, from 1 to 100, along with suggestions on how to improve (Proud says that Hello has accidentally sold a lot of people on getting humidifiers). You can check your score once a day, once a week, or once a year, since the app is always gathering data anyway. 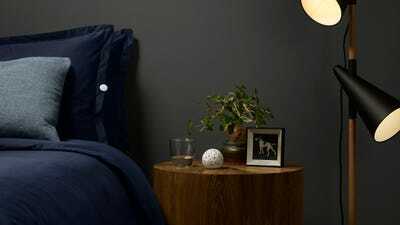 As more people use Sense, the better picture Hello’s systems can get of the factors that go into getting a good night’s sleep. He says Hello is using cutting-edge neural networks to help the computer “learn” from that data. “We’ve taught the computer what sleep looks like,” Proud says. Proud sees Hello and the Sense device as kind of on the vanguard of a new kind of computing, where intelligence just kind of hovers around you, rather than waiting for you to access a device. In the same vein as the Amazon Echo, Nest thermostat, or forthcoming Google Home, Proud sees Sense as something that’s there when you need it, but that vanishes when you don’t. Even with all of the overall hype to this market, though, Proud says he’d never really consider selling. He likes that he both lives and works in San Francisco, while potential buyers would probably make him commute to their offices in the suburban expanses south of the city. So long as he’s paying his rent (he can walk to work, and he gets to work on the interesting problems he’s laid out for himself), Proud says that he’s in no hurry to sell or otherwise exit. “I’m pretty basic in my life and needs,” Proud says.